Well Ok, Trump gets elected and gas prices drop – 20 cents in just a week. What more do you need to know? And, Florida beat LSU and won the SEC Eastern Conference. And the spec’s have started biting. You can’t tell me all that isn’t hooked. Nancy picked up a bridge game in Palm Coast yesterday. I drove her over and then went to checkout the work on the seawall and get in some surf fishing. They had finished the wall as planned and ended up dumping 14 truckloads of sand to cover it. 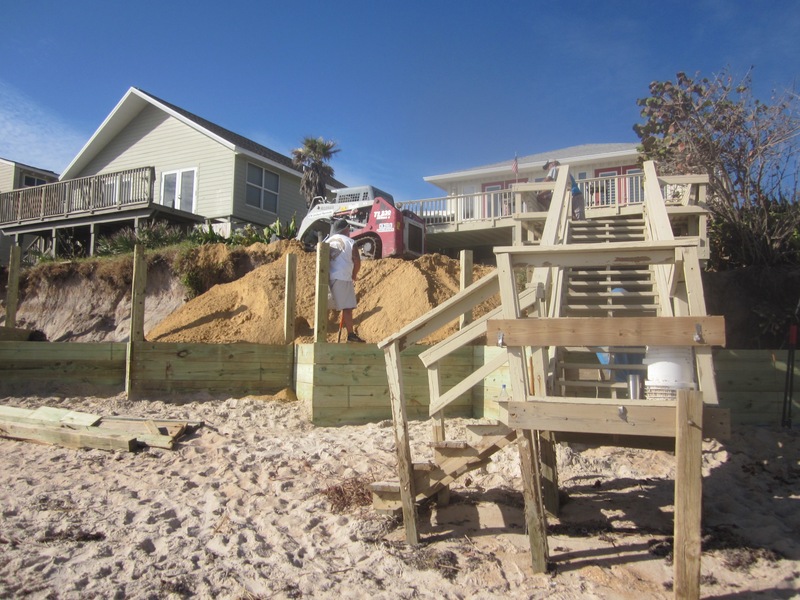 The owner of the place where we stay was still working on the beach access and has also decided to have sand dumped in to fill in the yard he lost but decided against actually building a seawall understructure. His ocean frontage is 75’ and he is estimated about 30 truckloads to do his. A truck load of sand is $150 to calibrate you on the cost. Not actually building a seawall sure makes the job easier. It’s going to be interesting over the next few years to see how the two jobs stand up to the surf. Both of these guys plan to plant sea oats and sea grapes into the newly poured berm to hold it all together. I got in a couple hours of surf fishing – no fish but a great day anyway. It sounds like this may become a regular event. The lake is producing speckled perch again. My neighbor caught a few the other day so I decided to give it a shot this morning. I caught about a dozen small ones before the wind came up so that adds another activity I have to squeeze into my otherwise busy schedule. We’ve definitely cooled down and that triggers the schooling/bedding activity from now until Feb or March. Cool down means night time temps in the 50’s with a projection for the 40’s next week. Bringing on the spec bite is the only thing that makes those temps tolerable. Also, spotted an otter swimming along fairly close to me. Haven’t seen one in a couple of years so that was exciting. Add lettuce to the list of pickables. Man that stuff sure grows fast. Along with the radishes, we now have the makings of salad every day for the next 5-6 months. Nancy made a large pot of radish soup yesterday. It uses both the greens and the roots. I’m going to try to do a better job this season of adding new seeds every few weeks so we have a continuous supply on into early summer. Off seawall construction duty and back on the house building project and fall/winter gardening. I was a bit surprised by the election outcome, particularly the magnitude of the Republican wins at all levels – Federal, State and local. Very reminiscent of the Reagan revolution in the 80’s. I hope the end results are as good. Being a country boy, I have always liked the electoral college concept and it worked for me again. Funny thing was my neighbor, a double country boy, kept complaining that the electoral system was unfair but at the same time he was a staunch Trump supported. I tried to explain to him how the system worked in his favor but he never caught on. He sure knows now and admits he was confused. When you see a Red/Blue map of the country down at the county level, it becomes obvious that this is a red country with a few very dense pockets of blue. I’ve started transplanting the seedlings I started on the porch a few weeks ago. Right now that includes Chinese cabbage and another cabbage type I’ve never heard of but sounds great for cole slaw and cabbage salad. Also, collard greens, three kinds of Kale, two kinds of broccoli, cauliflower, kohlrabi – this time a purple variety – and Swiss Chard. I’ve also put in a row of snap peas and a row of shell peas. Pretty easy to see how we get into a veggie overload. I broke down and planted some more onions. They’ve not done well at all for the last two seasons and I swore never to waste the space again. So much for that! My brain just has trouble dealing with an empty space in the garden. We’re actually eating from the garden again – picking green beans, radishes, and New Zealand Spinach. I didn’t plant the spinach but it self seeds all over the garden so I’m pulling it out like weed except for a spot, half a row, I’ve designated just for the spinach. I’m liking it a lot this season because I’ve learned to trim it early before the stems and leaves toughen and that makes a big difference. It’s great in the green smoothies. We’re about 2 weeks away from lettuce which is coming in strongly. I also just planted some Broccoli Raab seeds. I know they’ll grow just fine but I had decided specifically not to plant them this year. For the last two years they’ve just taken up space in the garden because nobody wanted them but the other day Nancy was watching a cooking show and the chef made a broccoli Raab pasta dish that turned her on big time. I was out in the garden planting the seed about 10 minutes later. We have an interesting natural phenomena going on this year – robins. We’ve been invaded by flocks and flocks and flocks of red chested robins. That happens every fall but this seems a little earlier than usual and for sure, in greater numbers. George assures me that this is a sign of a colder than usual winter. I think last year he attributed the lack of robins to a colder winter too. Finally got to try fishing in the surf. It’s been way too rough all week but seemed more reasonable today. Wrong – the seaweed was just too much to handle. And there were still some large planks bouncing around in the surf. So I substituted the fishing with Wacky Wings Wednesday at the Funky Pelican. Today is fish and chips night at the Golden Lion. I started helping the next door neighbor here at the beach with building an (illegal) seawall, quite a big job. I talked with a couple more home owners on the beach and the unanimous position they are all taking is to build “temporary” seawalls themselves and not pay $75K for the gov’t approved solution. The common enemy is the DEP (department of environmental protection) who are pro-turtle, anti people. The DEP position is basically that the beach belongs to the turtles and there should be no access to it at all. You can guess how that’s playing. The owner of the place where we stay plans to start his wall some time in December. I told him I’d be more than happy to come over and help. He said we could stay here at the beach as usual (for free) so that might make for a busy December. I was somewhat surprised by the election results but not blown away. By about 7PM, a few minutes after the polls closed signs of the upset started to appear. I crashed about 10PM and by then fully expected to wake up to a Trump victory. Right on. My write in candidate never made the news. Nice to see the libs/Dem’s rioting in the streets – unruly bunch; city folk; a real class act. Reminds me of the 60’s. Do these folks classify as deplorable? Update on the seawall- I ended up spending most of the day working on the project along with several other friends of the neighbor. We installed 15 x 12’ long 6”x6” posts where installed means setting them in holes 6’deep, spaced 8’ apart in a sawtooth pattern. Then bolting 8’ long 2”x12” planks between the posts. I quit about 5PM for dinner with Nancy and Tom and the work crew was just finishing up a couple hours later. Today the new sand should be brought in – I think on the order of 15 truck loads. Can’t wait for that. I took long walks on the beach, a half mile or so north and the same to the south. Almost all of the homes along the shoreline lost their beach access and maybe a third of those have rebuilt. Maybe half the places are seasonally inhabited so the owners have not yet appeared. I found one owner starting to clean up and rebuild his decking. Apparently the community at large is at odds about what to do regarding rebuilding the beach dunes and who should pay what. One plan being tossed around is for some gov’t agency to have a seawall built and assess the owners $75,000. Uncertain financing but this guy is not at all happy with the cost. His position and apparently many other’s is that the berm is gov’t property and they should have it restored. He also thinks the price is double what it should be. There is no doubt that those homes with well constructed seawalls did just fine but adjacent properties were hammered much more than would have been the case without adjacent seawalls. The seawall causes the water to move sideways along the berm and basically scours it away. The guy I was talking to had his house red-tagged as unlivable without a structural review. The sand underneath his house had been scoured out and you could see the support pilings which he thinks would support the house even if all the sand were removed. I can only imagine how heated these community meetings must be and how many lawsuits are pending. We’ve spent a couple of weeks a year here at Flagler for the past 10+ years and gotten to know the immediate neighbors. Had good conversations with them this week and it sounds like they have decided to build a “temporary” seawall. I volunteered to help them with the installation and they accepted immediately and said we can stay at our usual place instead of driving back and forth. They’re thinking December. Should be lots of work but I’m looking forward to it. Fishing is still off the table. The wind continues to blow directly on shore leaving the surf really nasty and full of seaweed. So we’re focusing more on the social side of the week and have decided to try several new places. Last night we hit a place called Break-awayz – craft beer and a finger food sort of menu. We settled on a couple of brewskis from a brewery in Tampa called Cigar City and a prisciotto/goat cheese flat bread. It’s right on the beach so the atmosphere is just that. There’s another new one on our radar called Bull Creek Fish Camp. Today we took a drive up north of Mainland – past Matanzas Inlet to see how that area fared. There’s very little elevation there between the ocean and the interstate and in one spot there was actually a new inlet cut by the storm. There’s a good restaurant at the inlet so we thought we might give that a shot. Nope, mostly washed or blown away so we decided to try another old favorite, South Beach which is literally on the beach but at a location where the berm is always low. Surprise, it was open and doing a good business. The building is really flimsy looking and there’s a covered back porch that you just know would blow away in a good afternoon storm but it survived and we had a great lunch. Tonight we’re focused on the Funky Pelican happy hour. We usually go on Wednesday, AKA wacky wing Wednesday, but Joey is coming up and we promised we’d go to the Captain’s barbecue place at Bing’s Landing. So many good options!!! At the last minute Nancy got a hankering for the Flagler Fish Company so that’s where we landed. We’re at the beach – or at least what used to be the beach. Hurricane Mathew really hammered Flagler Beach. The place we stay lost about half the back yard including the fish cleaning shed and the stairway and decking down to the beach. The house itself survived unscathed but wasn’t useable on our regular week because of the beach access. That was partially corrected for the first week of November, enough for us to use it. We arrived Saturday afternoon at high tide and was really surprised to see just how much beach damage there was. Almost all the stairways down to the beach were wiped out for the entire beach stretch and in some places the sand erosion brought the surf to within a few feet of the structures. At our place the back yard is about 20’ from house to the sand berm then a 10’ drop down to the surf. What made it even more foreboding was the wind howling along the coast creating a giant surf loaded with seaweed. Totally unfishable. I took a long walk on the beach and was really surprised how much it had changed. I didn’t note any structural damage but an almost total loss of beach access for the homes along the shore. About half had rebuilt temporary structures but I’m not sure what can be done about the loss of berm along the shoreline. There were a few places with seawalls and those made it just fine but in those cases, the neighboring places without seawalls were hammered far worse – which is why seawalls have been banned. We drove by all of our usual watering holes and pleasantly found they were all open for business. A couple were fairly well beaten up but still functioning. That plus the fact that the wind is supposed to subside and the weather forecast is for the low 80’s means that we’ll still have a great week. Thank God this election cycle is just about over. Florida, being a large swing state, get’s way, way, way too much attention. A constant flow of politicians and saturation political TV. I’d like both candidates to lose and plan to do a write in. Not sure who I’m going to honor with my vote but will probably pick one of my kids – the one I think is least liberal. We didn’t vote early (by choice) so we’ll drive back home on Tuesday to vote and check on the garden. We’ve had virtually no rain since the hurricane and all the seeds and seedlings I’ve planted need watering.